This 5 days safari fishing trip will take you to Ssese Islands which is a small cluster of over 80 Islands off Entebbe in Uganda. 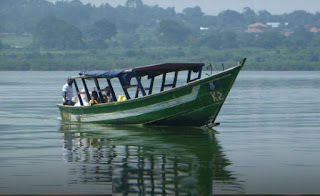 You will be able to see the thick Tropical Forest which is home to monkeys and birds, the fish caught include the Nile perch, tilapia, lung fish and many more. You will be provided with the necessary fishing equipment and head to Bukakata landing site for a ferry transfer to the Island. You will then go for a safari fishing experience on Africa’s largest lake and also visit the local fishing villages as well as a guided nature walk through the forest. You may also decide to go for another fishing session at night.raft. Arrival at Entebbe International Airport and transfer to your overnight accommodation establishment. After breakfast you will be transferred to Lake Victoria for fishing from a fully equipped boat as well as other fishing equipments. Dinner and overnight at Entebbe. After breakfast, you will be transferred to Bukakata landing site for a ferry transfer to the islands. Before reaching Bukakata, have a stop over at the Equator for the some photos. Have en route lunch and then proceed to Bukakata landing site. Board a ferry to Luuku site on the side of the beautiful Ssesse Islands. Relax at this beautiful island. Dinner and overnight at Ssesse Palm Beach Resort Beach hotel/ Ssesse islands beach hotel. After breakfast, go for another thrilling moment of fishing on Africa’s largest lake. In the afternoon visit the local fishing villages or go for a guided nature walk through the forest. If not satisfied with your catch you can decide to go for another fishing session. Dinner and Overnight at Ssesse Palm Beach Resort Beach hotel/ Ssesse islands beach hotel. Early morning departure from the islands to Entebb.